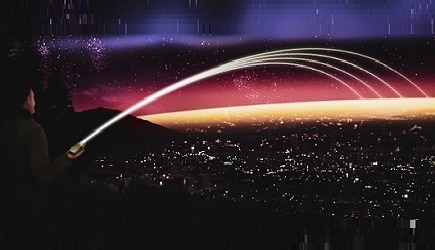 VidaRF has introduced Hand Formed Semi Flexible cable assemblies that operate from DC to 18 GHz. These cables are an alternate to semi-rigid cables and are available with a wide variety of connector combinations. The outer shield of the cable is copper braid, silver plated to minimize signal leakage and maintain flexibility for ease of bending to your requirement. The low-PIM Hand Formed Cable Assemblies offers excellent return loss and insertion loss. They meet MIL-C-17 standards and can operate over a temperature range of 55°C to +200°C. 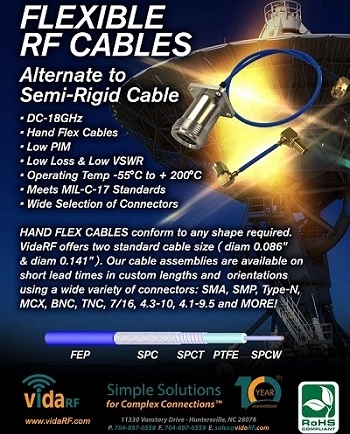 VidaRF offers two standard cable size (diam 0.086”& diam 0.141”). The cable assemblies are available on short lead times in custom lengths and orientations using a wide variety of connectors: SMA, SMP, Type-N, MCX, BNC, TNC, 7/16, 4.3-10, 4.1-9.5 and more. For more information, click here.